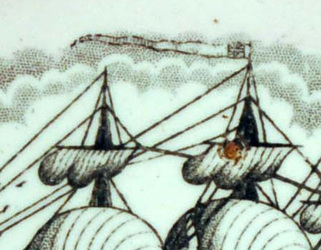 The Dixon transfer (above left) has a shorter pennant flag flying from the centre mast. 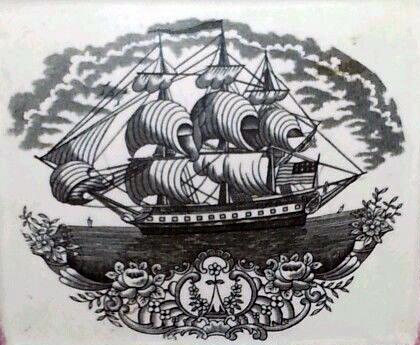 The transfer attributed to Newbottle/Moore (above right - detail from a Moore-attributed plaque) has a long pennant that extends way beyond the first mast, and points downwards. 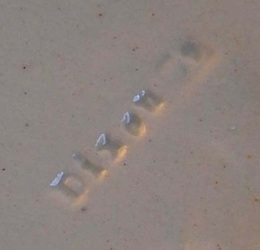 Again, the Dixon detail is shown on the left, and the Newbottle/Moore on the right. 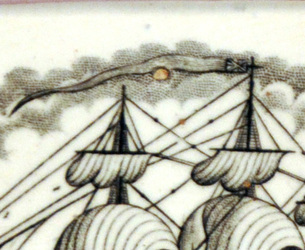 Note the positioning of the small ship on the horizon. 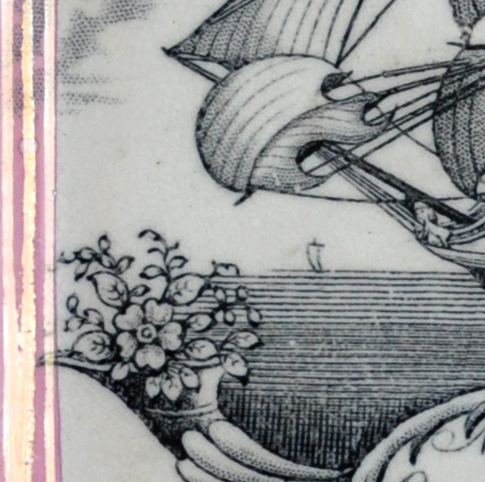 Also, note the difference in the rigging hanging above it. 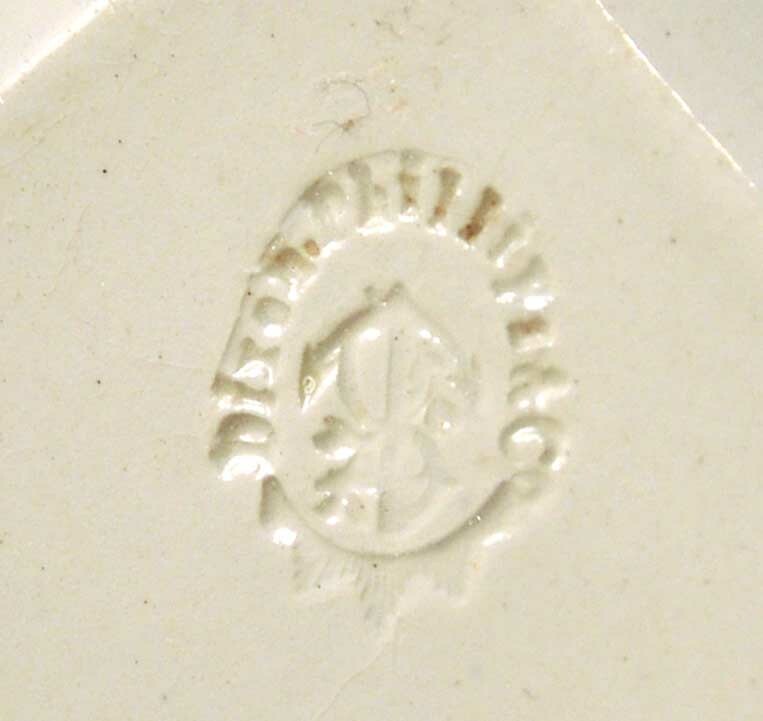 Rectangular versions exist with the Dixon, Phillips & Co anchor impressed mark (1839–c1850) and the Dixon Co impressed mark, as shown above (c1851–1865). 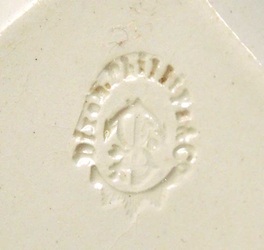 The marks relate to the plaques to their left. 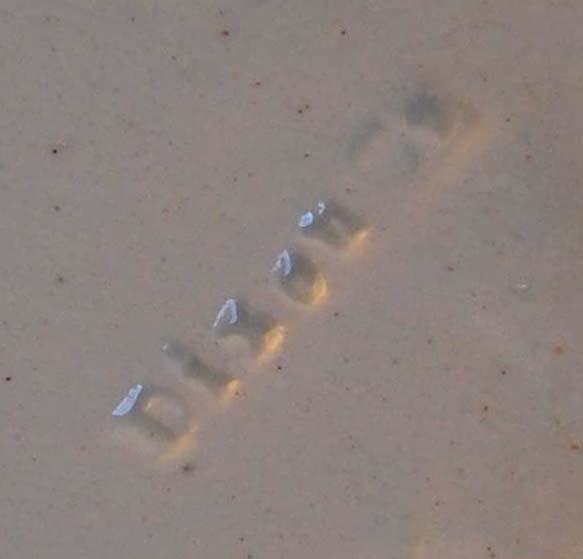 The last three plaques all have the 'Dixon Co' impressed mark. 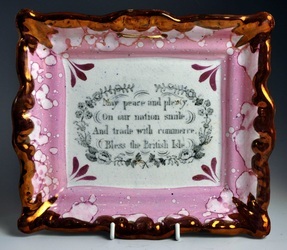 The rectangular plaques measure 210mm x 185mm. 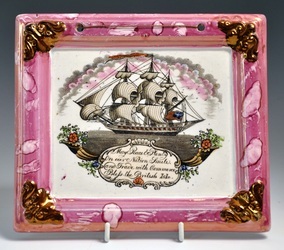 It is rare to find these Dixon plaques with coloured enamels (see last photo). The plaques above are attributed to Newbottle, c1845. 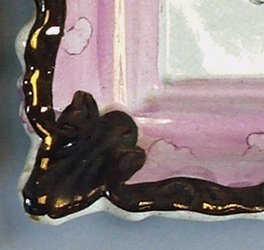 The first four are finely potted and the copper lustre is painted neatly up to a line, so that the white of the edges can be seen from the front (see detail). 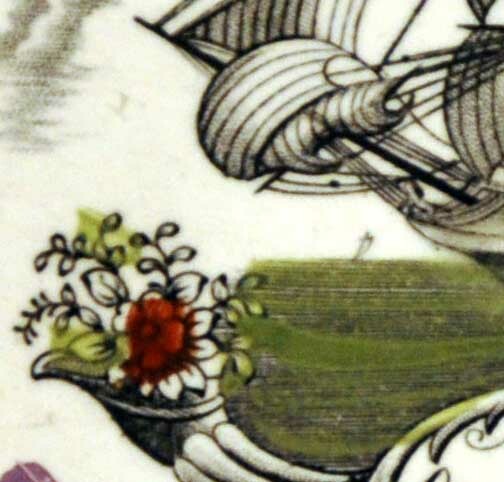 The centre row have unusual blue or green corners. 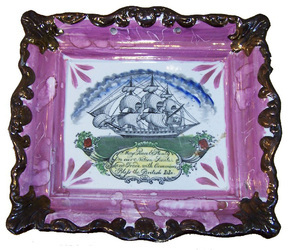 The plaques are 230mm x 200mm. The bottom centre plaque is smaller: 195mm x 167mm. There are many variations of enamelling on the more common brown-bordered plaques (attributed to Moore), using combinations of iron red, yellow, green and blue. 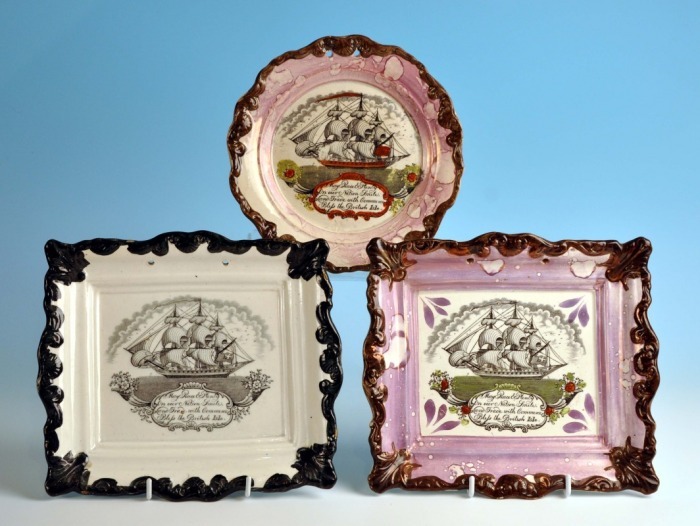 These plaques were likely made in the 1860s. 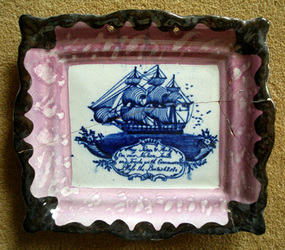 However, the undecorated version (top right) might perhaps be as late as the 1870s. 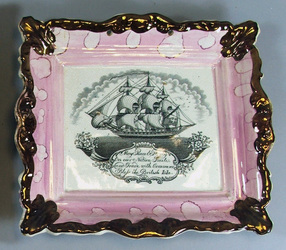 The rectangular plaques are 230mm x 205mm. 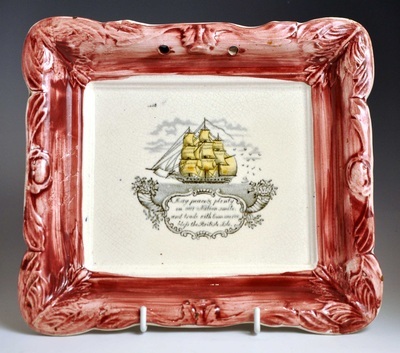 Interestingly, this transfer has never yet been recorded on orange-lustre plaques. The transfer appears similar to the Dixon version, except for the 'S' in 'Smile'. 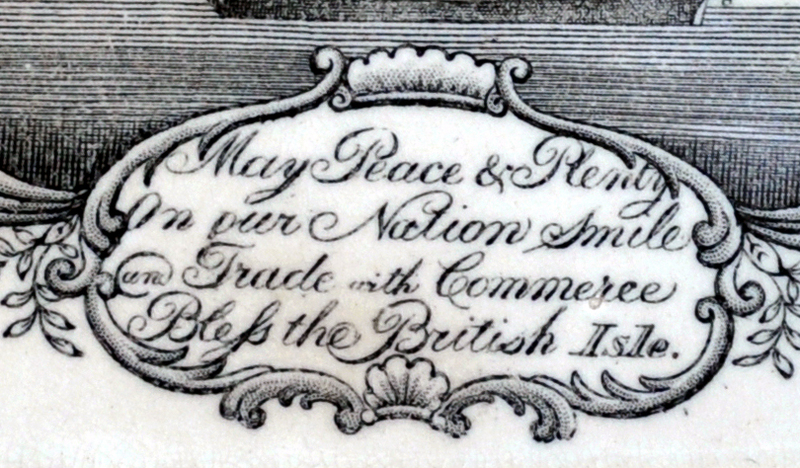 However, that could have been re-engraved. 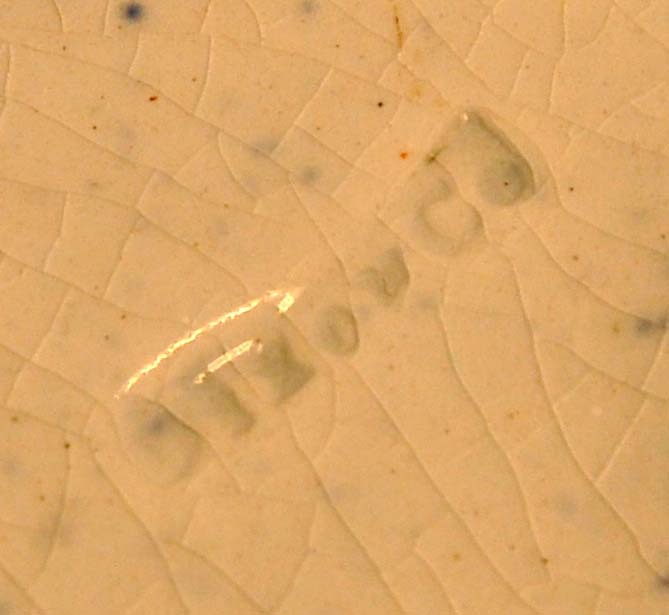 We know that John Carr purchased Dixon transfer plates when the Garrison pottery closed in 1865. 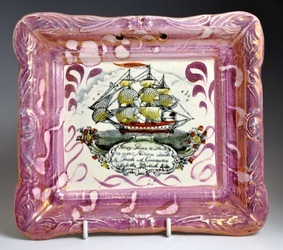 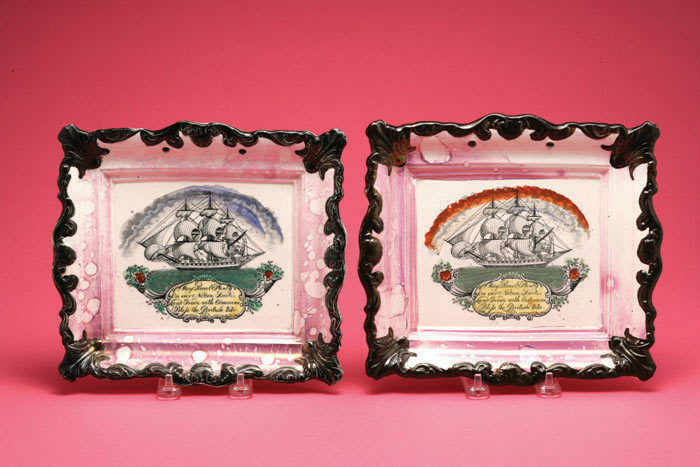 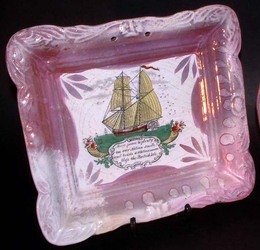 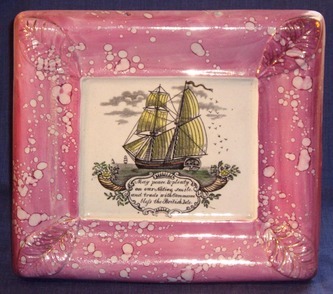 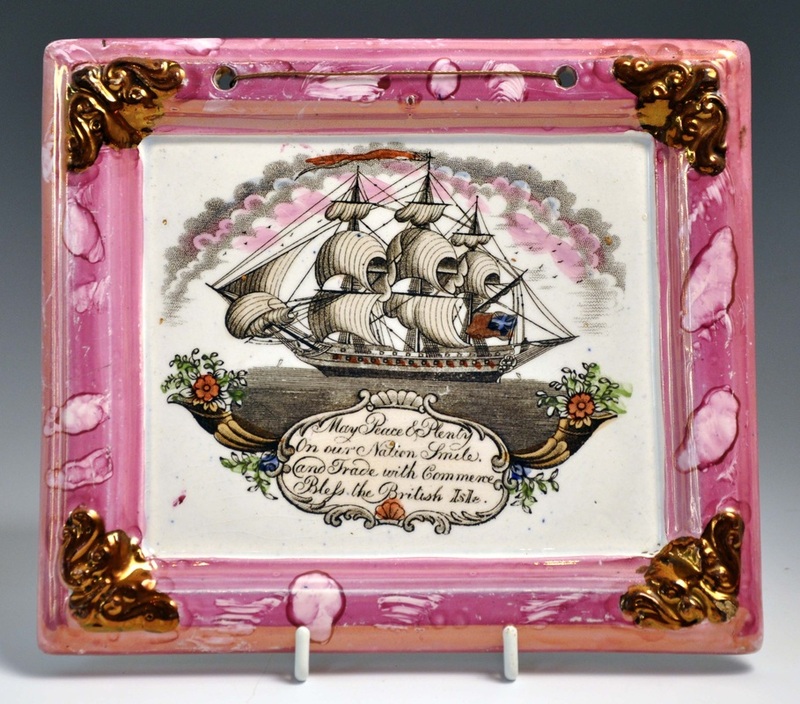 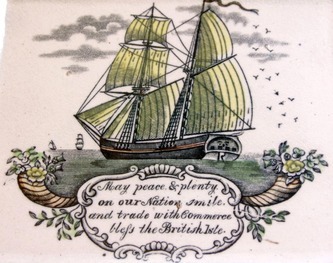 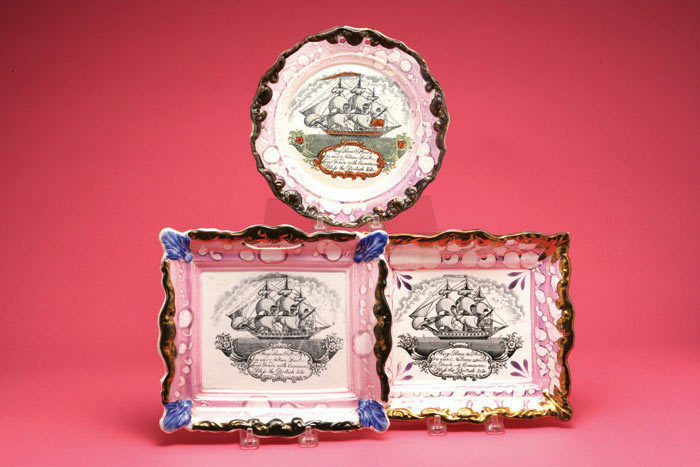 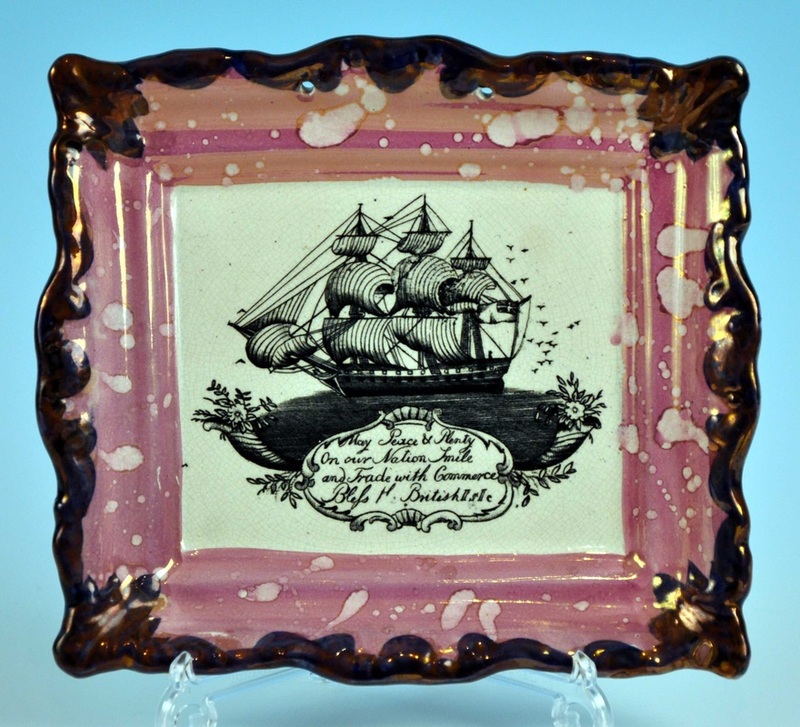 The top left plaque, from the Norfolk Museums collection, is 213mm x 188mm, and shows the ship facing in the opposite direction. The plaque on the right has a rare blue-printed transfer. 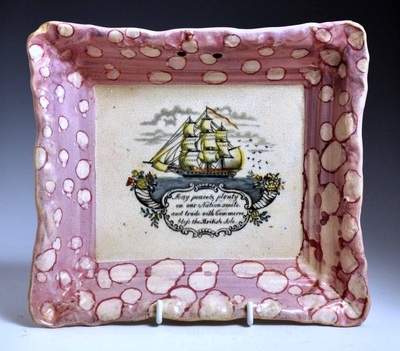 These smaller plaques often have subjects associated with John Carr's pottery, but these transfers are different to that on the Carr plaque in the section above. 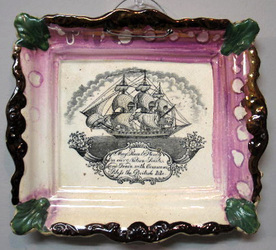 The two plaques avove left are from the Albion Pottery, Newcastle. The transfer detail and impressed mark relate to the first plaque. 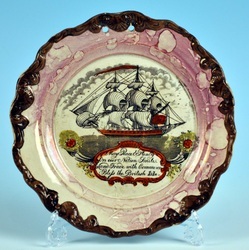 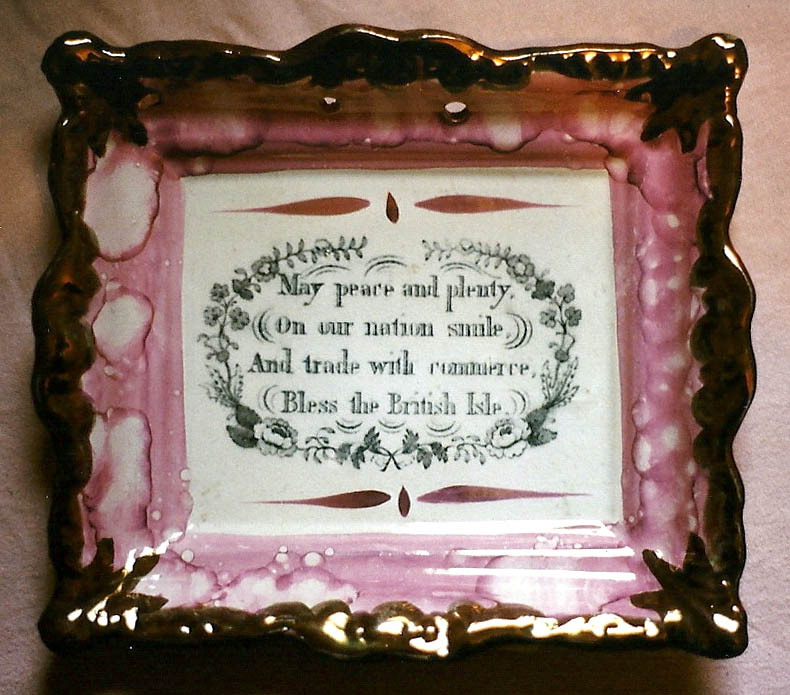 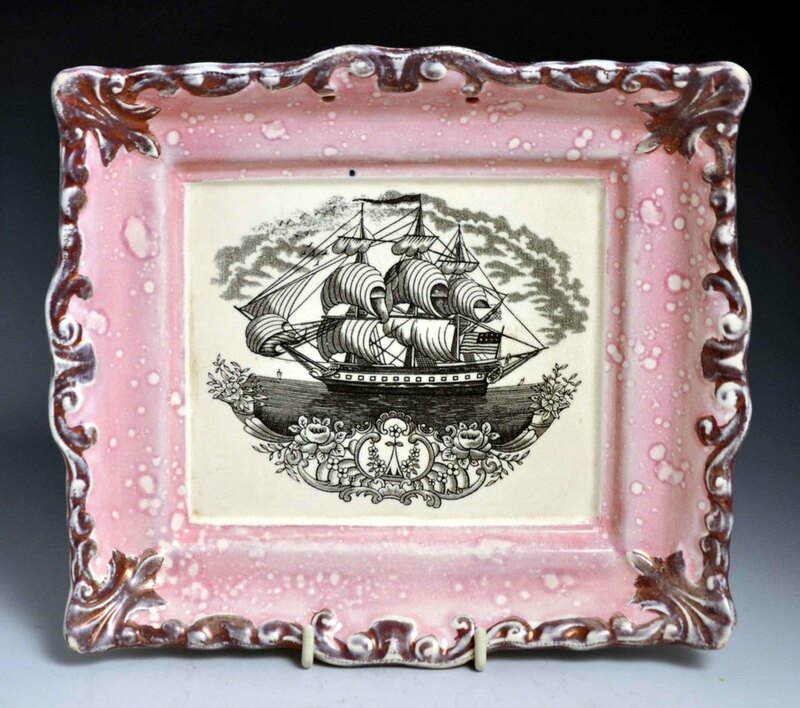 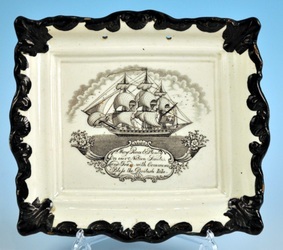 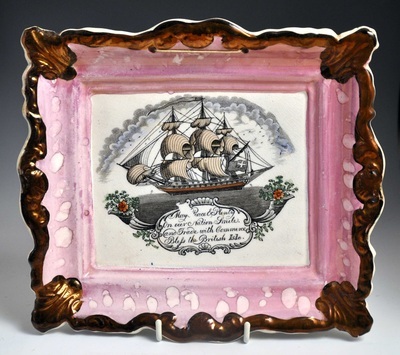 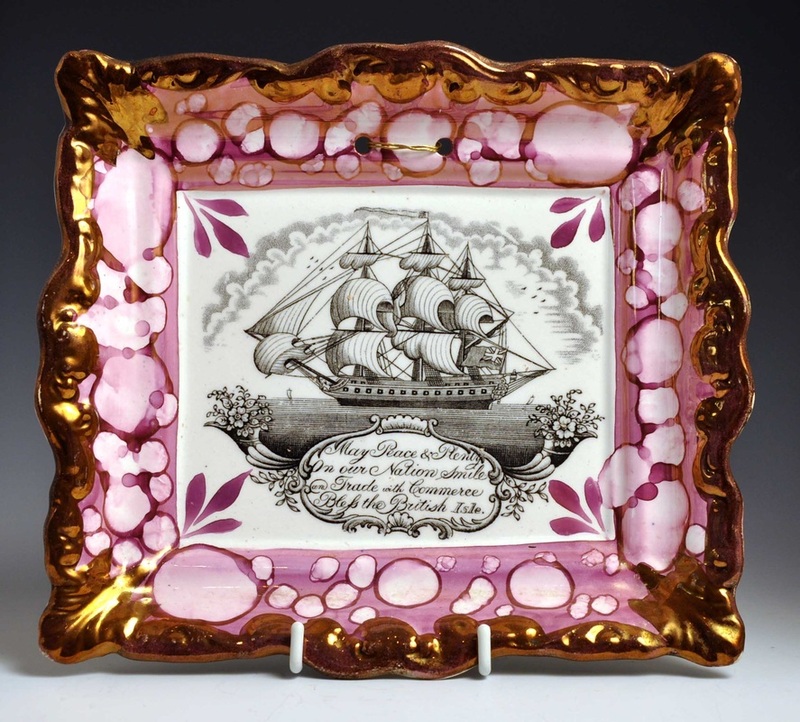 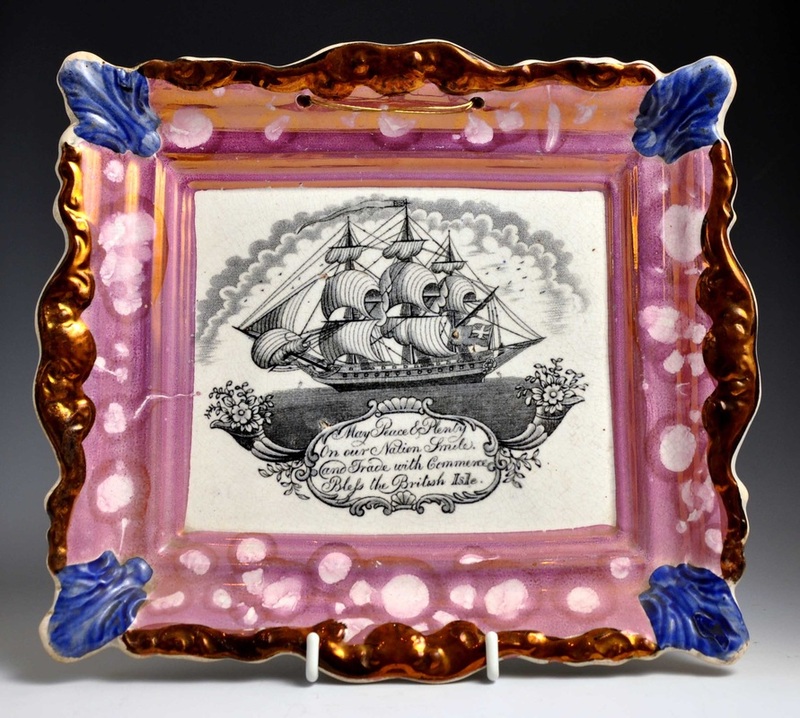 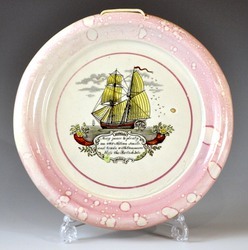 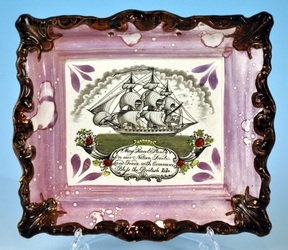 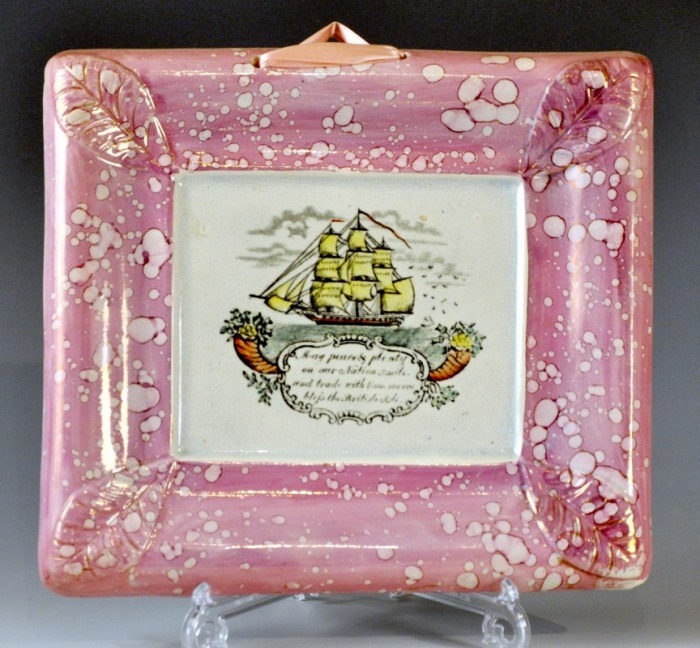 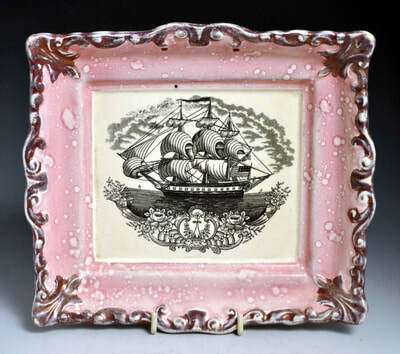 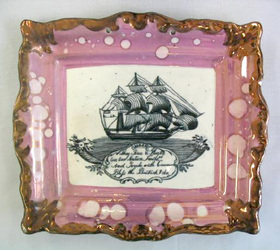 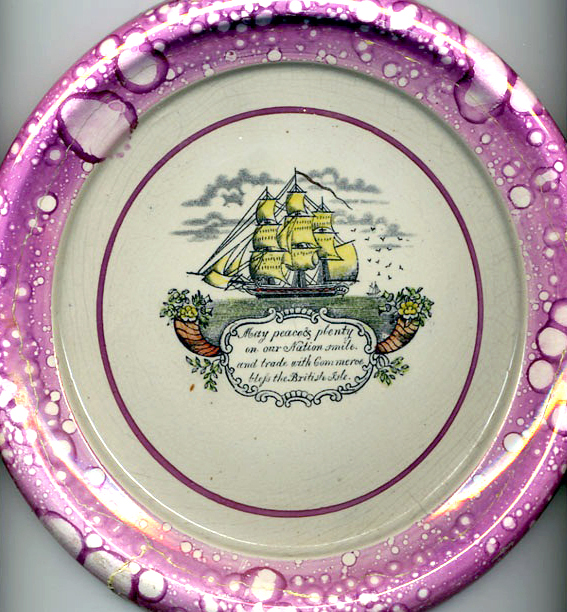 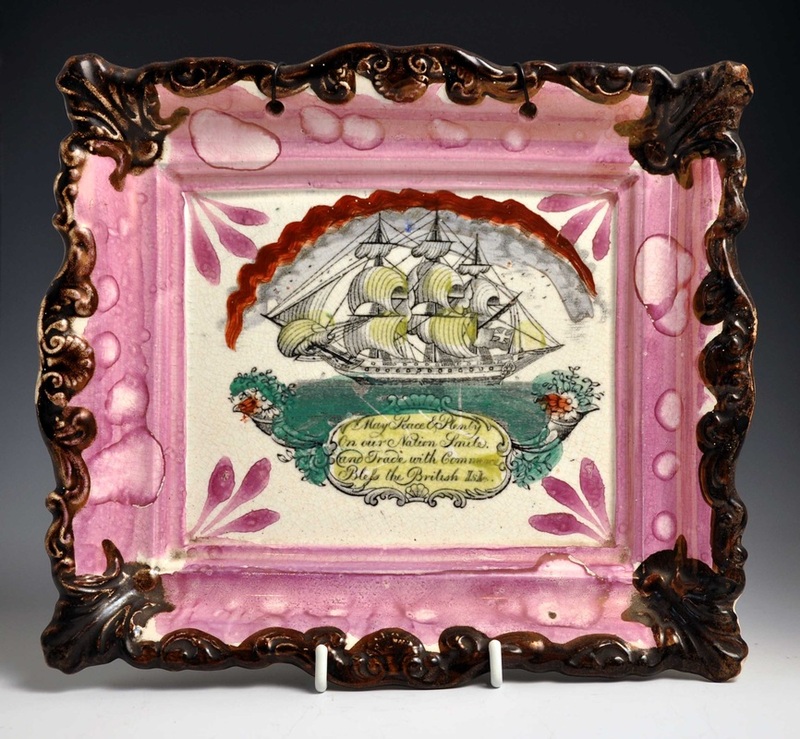 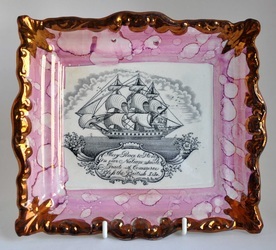 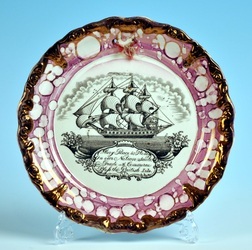 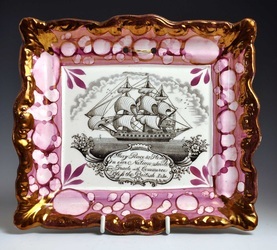 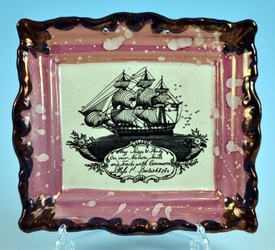 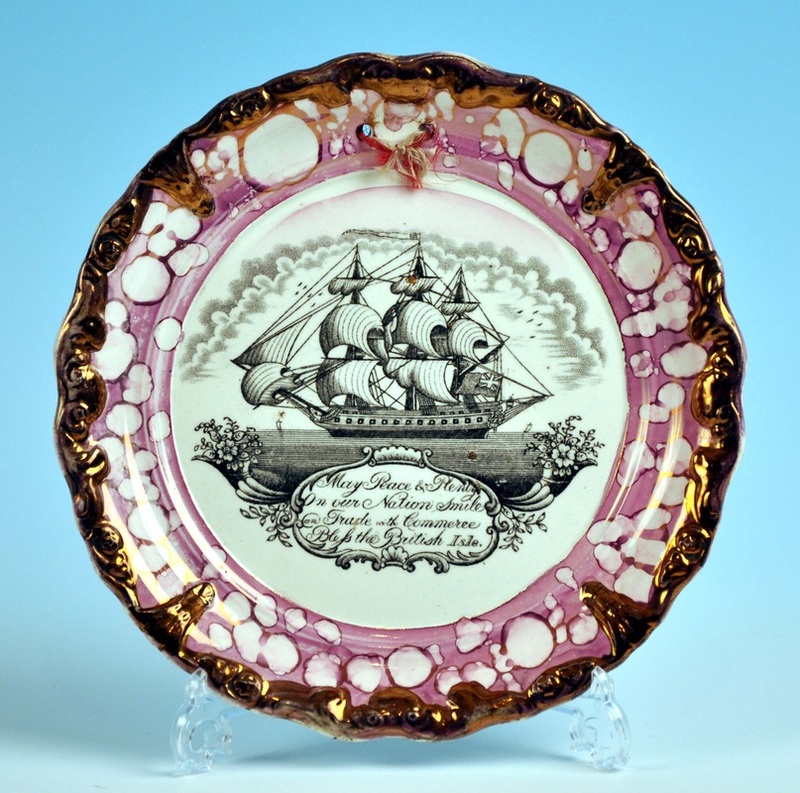 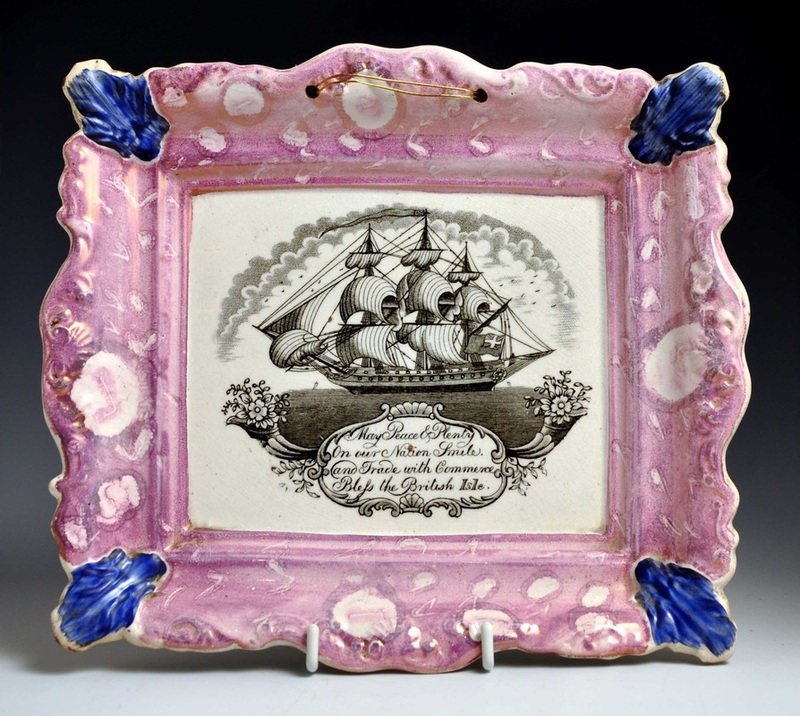 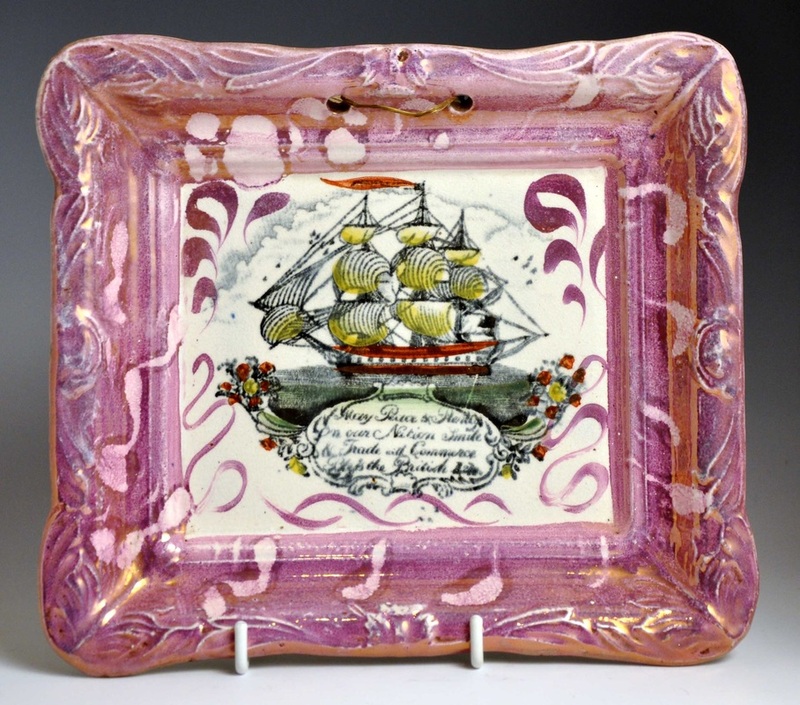 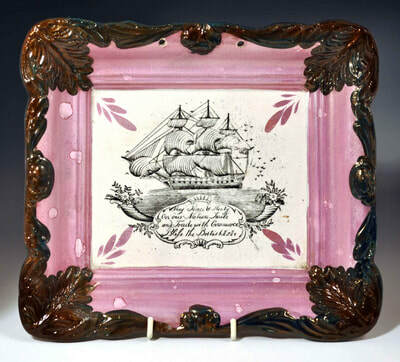 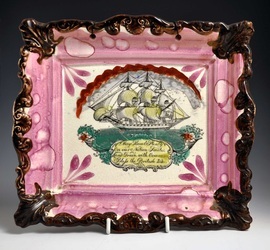 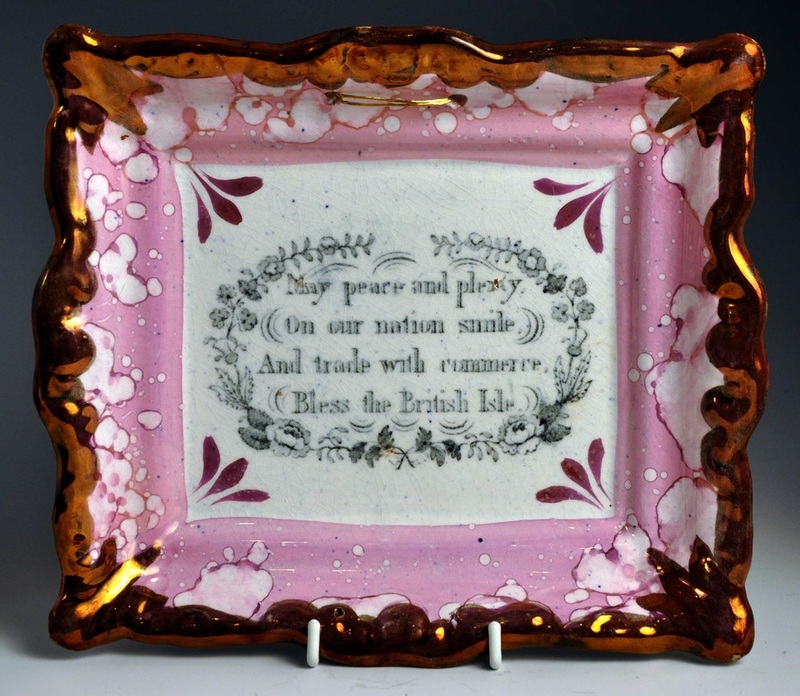 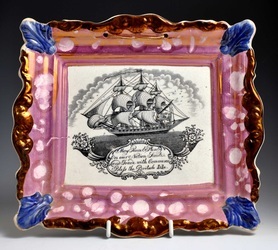 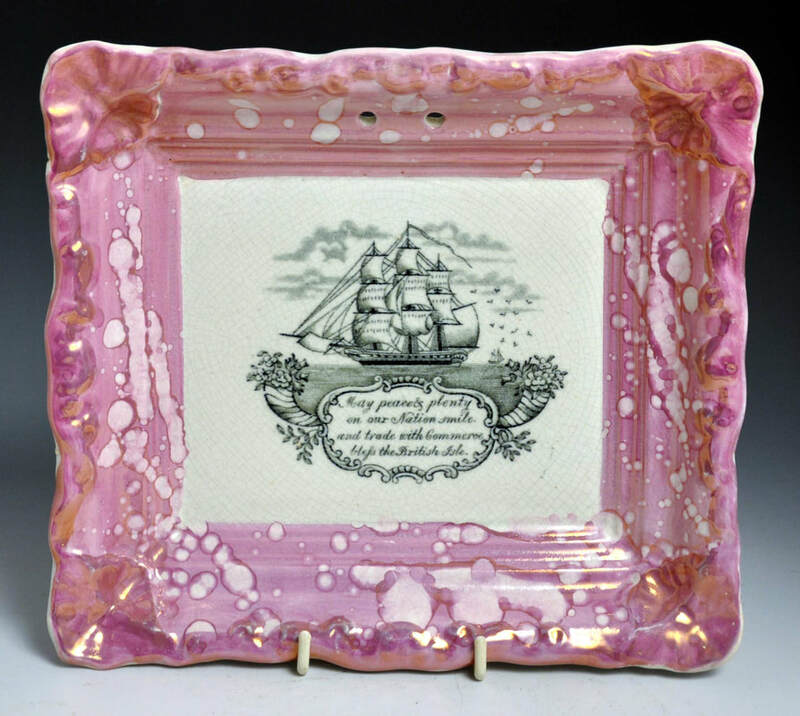 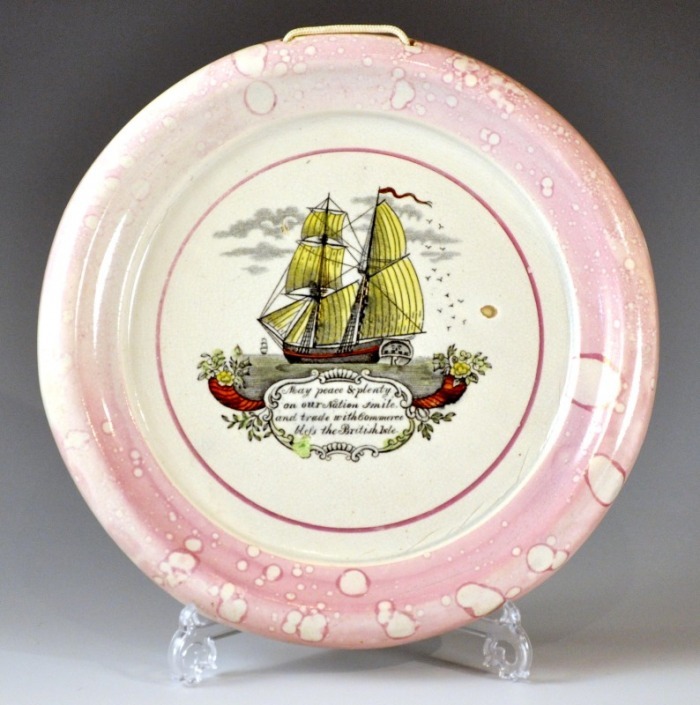 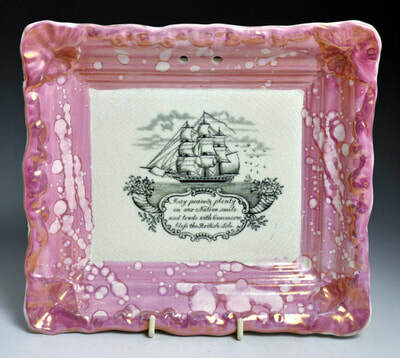 The last plaque is attributed to John Carr, who apparently bought the transfer plates, c1864, after the Galloway and Atkinson partnership at the Albion Pottery dissolved. 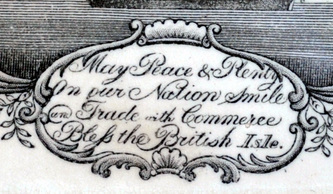 Above is another variation of the May Peace & Plenty transfer. 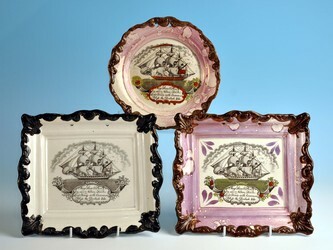 Again, the first four plaques are from the Albion Pottery. 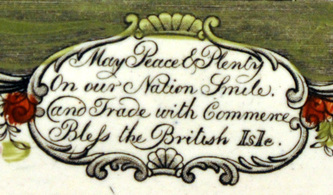 The last is Attributed to Carr. 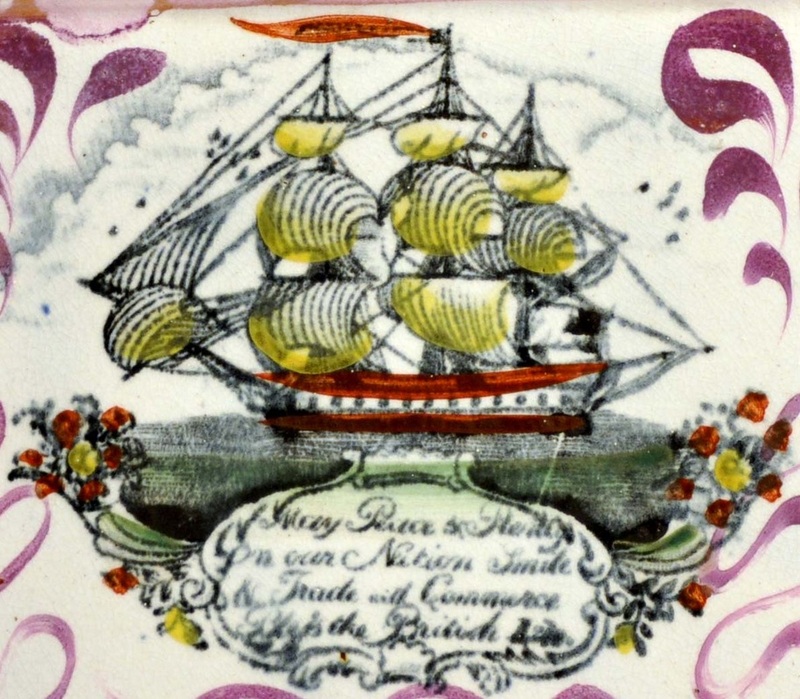 This rare version of the transfer has no verse, and shows a ship flying an American flag. 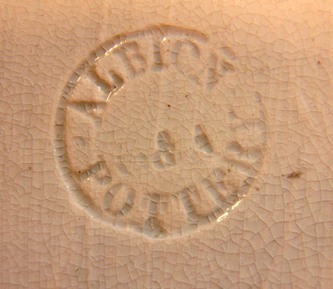 The mould has a distinctive border used exclusively by Adams' Pottery. 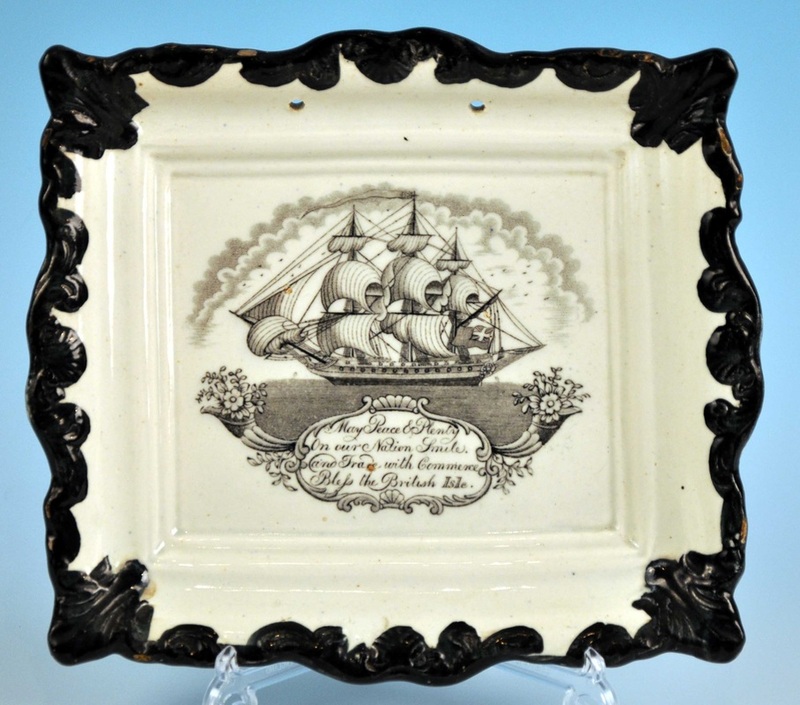 Although the plaque is unmarked, it is likely that it was made by that pottery for the US market in the first half of the 20th century. 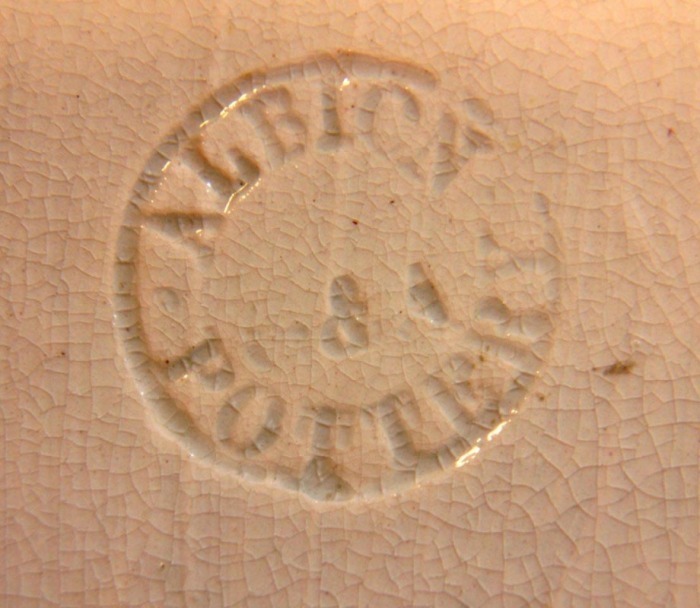 Above are two photos of a rolling pin. Although unmarked, the lustre decoration is typical of Gray's Pottery in the 1950s. 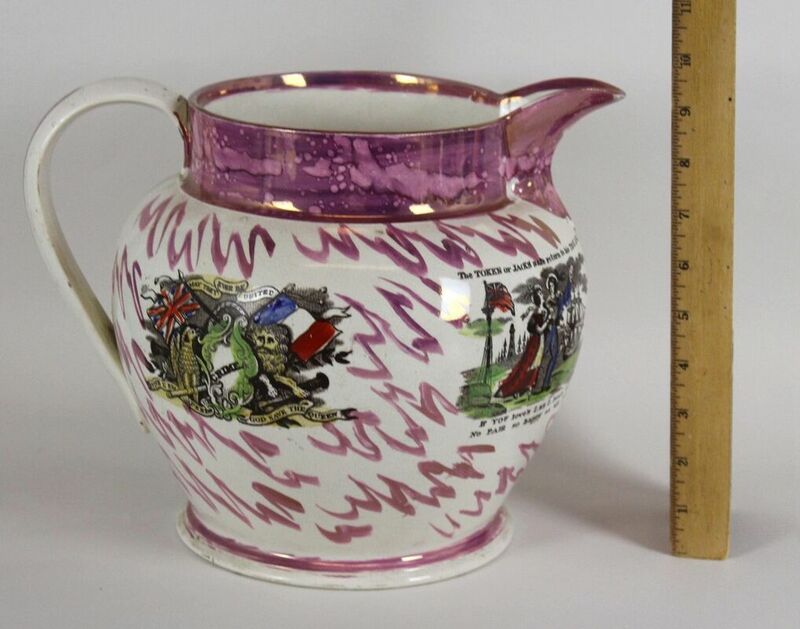 Despite being relatively modern, these items are very collectible (see the Reproductions page for more Gray's items). 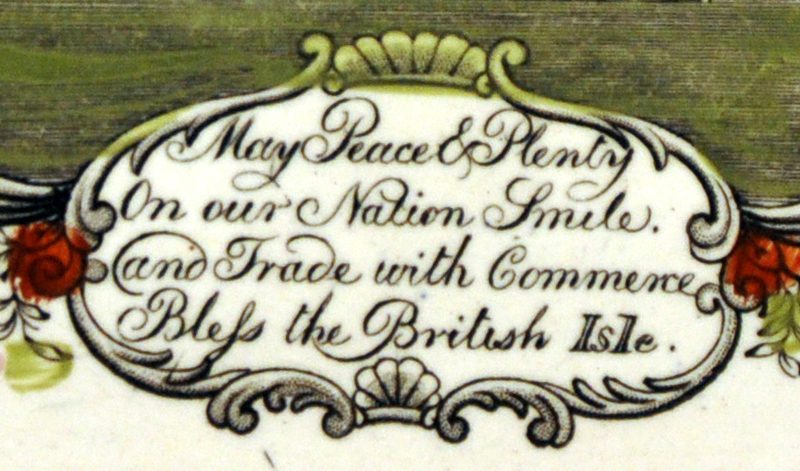 Note that on this transfer there is only half of the verse.